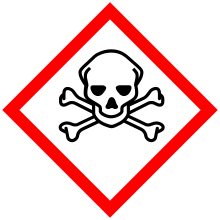 The internaitional pictogramme for poisonous substances. The skull an crossbanes haes lang been a staundart seembol for pushion. In biology, pushions are substances that cause disturbances in organisms, usually by chemical reaction or other activity on the molecular scale, when an organism absorbs a sufficient quantity. ↑ "Poison" at Merriam-Webster. Retrieved December 26th, 2014. This page wis last eeditit on 22 Apryle 2019, at 03:36.